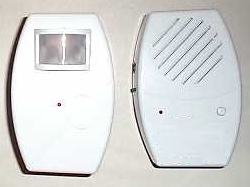 Instant Alert Wireless Chime / Remote Signal Bell; Elderly, Physically Impaired, Arthritis Sufferers. A great way to keep track of the comings and goings of Altzheimer's patients, the elderly, children or anyone. Simply place the transmitter near the bed, on a dresser or at the doorway and anything passing by the transmitter will cause the receiver to sound a pleasant chime. Can also be placed by the front door to alert you if anyone tries to come in or leave the home, place one outside to tell if someone is coming up the driveway. Minimal to no installation necessary except to strategically place transmitter. Wireless with a 400 ft. range. Requires one 9 volt and three 'AA' batteries.